Pour out some sweat tea, fire up the banjo, warm up the rocking chair, and get ready for some good old fashioned Americana rock that will easily set your soul aglow and leave you with aspirations towards shucking and diving as The Dustbowl Revival serenade you with some of the most perfect blend of blues, jazz, and pure down home American fun. Americana can mean so many different things to so many different people. And as far as the Holy Ghost Station EP is concerned, it means combining every genre of music that makes our country’s version of dirty life so damn crisp and clean. 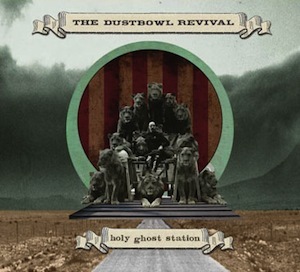 The Dustbowl Revival is just about everything their name represents. The songs these entirely eccentric characters create are a brilliant modernization of a time when having the blues was true to life, and a good time could be found in the simplicity of a few instruments being played fast or subtle, short or sweet, and with a strenuous desire to entertain, not just to sell a few records. Holy Ghost Station is a record that enlightens the soul, and disproves the idea that there is no talent left in the youth of our nation. This is a record that is perfect for the young and old. With a fire up the kazoo, and clean out the horns attitude, this is about as perfect as nostalgia based jazz-folk music can get. 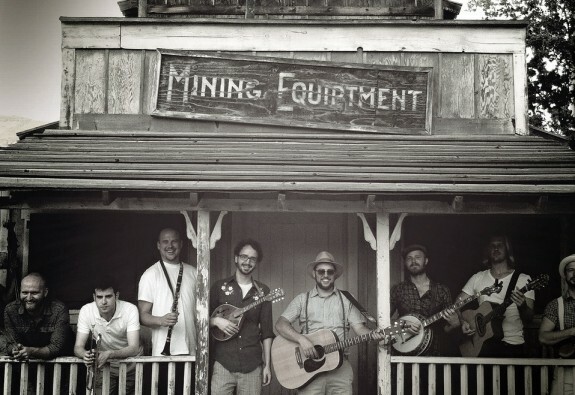 The shared duties of The Dustbowl Revival is definitely one of the band’s most appealing aspects. Each and every member has a place, and they sit in as well as they could ever wish to. There is the ever important dueling male and female vocals that seem to be a dire essential these days. And the idea that the fiddle, banjo, horns, etc. could be played so well by some folks under 70 is a wonderful thing. If you feel the need to get in touch with roots you’ve never really understood, Holy Ghost Station is without a the album you most definitely should be getting on down to.